Minimum Data Points Constituting a Trend Is 3? This article explains why three is never the right answer, and this article explains why asking how many minimum data points are needed to identify a trend is the wrong question. Recently a client sent me an email asking the same question about data analysis in two different ways. The first question asked, “How many of the same situation need to occur before it is considered a trend?” The second question asked, “How many nonconformities can occur before a CAPA should be opened?” This question can be asked a hundred different ways, but it’s the wrong question. In the graph above we have variable data rather than attribute data. When you have variable data, the answer regarding the number of minimum data points is always a quantitative answer that is objective rather than subjective. Typically the new data point lies outside of the upper or lower specification for the element being measured (i.e., >6.6 or <6.1 in the graph above). Even if the new data point remains within specifications, a CAPA may still be issued if the new data indicates that there has been a shift in the normal distribution of data. In our graph above, on March 13 the newest data point was 6.37. Although this value is within specifications, in fact close to the center of the range, this value represented a shift in the trend that exceeded the normal distribution of data observed for the previous 12 days of the month. The mean for the first 12 days was 6.54 and the standard deviation was 0.0250. Many people establish alert limits that equal mean +/- 2x standard deviation (i.e., 6.59 and 6.49) and the action limit is often set equal to the mean +/- 3x standard deviation (i.e., 6.62 and 6.47). Therefore, a value of 6.37 is well outside the normal distribution for the first 12 days of the month–but not outside specifications. The shift in data values for this graph indicates a shift, but the process was capable of remaining within specifications before the shift and process capability actually appears to be slightly better after the shift. In this case, there is no need for a CAPA but if the reason for the shift is unknown an investigation would be recommended. However, if different lower specification were chosen (e.g., 6.4) then the new data point on March 13 would be outside the specification and product would be identified as nonconforming. Nonconforming results should always trigger in an investigation? If the process was validated and the mean +/- 2x standard deviations remains within the specifications, then greater than 95% of the product should be conforming. If the the mean +/- 3x standard deviations remains within the specifications, then greater than 99.5% of the product should be conforming. Therefore, based upon the data from the first 12 days of March any data points that are lower than 6.47 should be very rare unless there is a process shift. An investigation of the data point on March 13 should result in a CAPA unless the outlying data can be explained and a new trend with a lower mean is expected. If the new data point cannot be explained, then only one new data point is needed and the data does not even need to be nonconforming. If no actions are taken the drop in the measured value could continue and nonconforming product could result, while any action taken on March 13 is a preventive action. In the case of the first question, the negative customer situation that is reported to a company may be an attribute rather than variable data. For example, “customer unsubscribed” after an email blast went out is a negative customer situation. If you know the % of customers that unsubscribed when email blasts go out, then you have variable data. If you only know that one person unsubscribed, then you only have an attribute (i.e., unsubscribed instead of continued subscription). The first time an unsubscription occurs, you should do an investigation to see if there is an issue other than frequent email blasts that exceed a customer’s expectations in frequency. The action taken could be to establish an alert and action limit for unsubscribed emails based upon industry norms or the % calculated from the first event. Instead of asking how many minimum data points are needed to initiate a CAPA, we should make sure we are measuring the right variables. The % of unsubscribed is a valuable variable data point, but knowing that one person unsubscribed without knowing how many people received that email blast is not nearly as helpful in making future decisions. Another question is to ask, “Why did the person unsubscribe?” If the reason is unknown, you may want to contact the former subscriber and ask them–but probably not by email. If you have a theory why people are unsubscribing you can also perform an experiment to test your hypothesis. If you think the cause is that emails are being sent too frequently, then you can split your list and send the same emails to two halves of a list at different frequencies. If you are correct, then the list that has more frequent emails should also have a higher % of unsubscribers. This type of design of experiment (DOE) is one of the root cause investigation tools I recommend in my Risk-Based CAPA webinar. Whenever you establish a new metric or quality objective, you should also establish a limit for when you intend to investigate and when you intend to take preventive or corrective actions. If you simply start measuring a variable or attribute, you may have difficulty recommending actions to management during your next management review and explaining why actions were not taken during an FDA inspection or an audit. This article explains details of implementing a CAPA preventive action and corrective action for packaging issues. Specifically, containment measures, corrections, corrective actions and preventive actions to address the root cause identified in part 1 of this case study. When you learn of a packaging complaint related to a specific lot, you also need to determine if other product associated with the lot is safe to ship to customers. You should not attempt a correction and removal of product unless you have a reasonably high level of confidence that there is a packaging issue with the lot or a portion of a lot, but you might consider placing product from the same lot in your inventory on hold until your investigation is completed. If you confirm that you have an issue with a specific lot, lots or portion of a lot; then you should initiate correction and removal of product to prevent potentially, non-sterile product from being used. This type of problem could result in a Class 1 recall (i.e., the most severe of the three categories). Therefore, you need to act quickly and according to established procedures for corrections and removals. If you find a problem there is little you can do to fix the existing, defective packaging other than to repackage the product. If the product has only been sterilized once, and you have revalidated the product for resterilization, then you can repackage, relabel and resterilize. In order to ensure traceability to the lot that has been reworked, you may need to revise the labeling (e.g., add an “R” to the lot number). If you have not revalidated the resterilization of product, you may want to use this lot for validation of resterilization instead of throwing it out. However, sometimes your best option is to scrap the product. Additional corrections may involve correcting the calibration of a testing device or performing repair to sealing equipment. You might modifying a specification on a drawing. You might correct a work instruction that did not have the correct validated sealing parameters. All of these could be corrections. Investigation of root cause (CAPA Step 3) occurs in parallel with containment (CAPA Step 1) and correction (CAPA Step 2). Corrective actions (CAPA Step 4) prevent the packaging issues from recurring, and they occur after the first three steps, because you can only implement corrective actions once you understand the root cause of the quality issue. The best tool for evaluating your current process controls and evaluating the implementation of new corrective actions is a process risk control plan. In order to do this you need a process flow diagram and a process risk analysis. Each step of the process from raw material fabrication of film to the released product needs to have potential hazards identified, risks evaluated and risk controls implemented. You should use your process validation to verify the effectiveness of process risk controls quantitatively. If the process capability is greater than 95% for each parameter and you have addressed every possible source of problems, then you probably won’t gain much from additional risk controls. However, many companies reduce their sampling or rely on certificates of conformity to ensure that the process is controlled adequately. You already had a packaging issue with one lot of product, but you could have another issue with a different product or lot for the same reason or a different reason. If the product is the same, and the reason is the same, then actions taken are corrective actions. If you take action to prevent occurrence of this issue with a different product, or you prevent other potential causes of packaging issues by initiating more robust monitoring and process controls, then your actions are preventive actions. Often you will want to implement both types of actions. In the box plot example provided in this article, Lot D was detected at incoming inspection as having peel test results that were outside the alert limit but acceptable when compared to the specification limit for peel testing. The alert limit was established during validation of the pouches and comparison of lots A, B, C and D demonstrate that Lot D is slightly lower in peel strength. The manufacturer may choose to use the lot, but the sampling plan for in-process peel testing may be altered or the manufacturer may choose to place the new lot in quarantine while an investigation is performed. This is a CAPA preventive action. Perform peel testing and/or bubble leak testing of packaging raw materials as part of the receiving inspection process and perform data analysis of the incoming inspection samples to determine if lower or higher alert and action limits should be established for the new lot of raw materials. The limits should be based upon the manufacturer’s seals as well as your own seal. Retain remnants of in-process peel testing, include the remnants with the sterilization load, and then store the remnants for real-time aging. Consider implementing visual inspection tools that are able to detect sealing imperfections non-destructively. Increase the number of samples you test (e.g., 1 to 3 or 3 to 5) for each lot of product sealed to increase your confidence that the seals will be within specifications. Perform statistical analysis of in-process data for seal peel strength in order to identify potential lots with packaging issues prior to release. Evaluate the performance of the packaging at temperature and humidity extremes that may be higher or lower than the conservative estimates for ambient conditions (e.g., 30C vs. 25C). In addition to the previous article that was part 1 of this case study, I have posted 10 other blogs specifically on the topic of CAPA. There is also a CAPA procedure you can download from this website. If you are interested in learning more about a risk-based approach to CAPAs, then please click here. This article lists 7 steps to writing a more effective CAPA procedure, ensuring that your procedure is risk-based and training people effectively. During a recent internal audit I was performing for a new client, I noticed that they were not meeting one of the requirements of their CAPA procedure. Specifically, the procedure indicated that all CAPA plans must be written within seven calendar days of initiating the CAPA. Despite this requirement in their procedure, the client was indicating that CAPA plans were due within 30 calendar days on their CAPA form. This example is a minor nonconformity, but the reason why this client was not following their procedure is more interesting. The procedure was 100% compliant with FDA regulations, but the procedure did not match how the company performed the process. The procedure and the process MUST match. This client purchased their CAPA procedure from a consultant, changed the title, and had everyone in the company “read and understand” the procedure for training. If this sounds like your company, I’m not surprised, because this is not uncommon. To avoid the mistakes this client made, follow the following steps for writing your own CAPA procedure. The specific order of steps is important to creating a CAPA procedure—or any procedure. Writing a procedure that matches the form used with that procedure helps people understand the tasks within a process. Procedures are often unclear, because the author is more familiar with the process than the intended audience for the procedure. An author may abbreviate a step, or skip it altogether. As an author, you should use an outline format and match your CAPA form exactly. There should be nothing extra in the procedure and nothing left out. In fact, my CAPA procedure is only 4 pages. The CAPA procedure is a 4-page procedure which includes a CAPA form, and CAPA log. The procedure is compliant with ISO 13485:2016 and 21 CFR 820.100. The biggest problems most companies have is that quality personnel has primary responsibility for the CAPA process. Quality personnel should be monitoring and measuring the CAPA process and reporting on process effectiveness to top management–not doing all the work associated with every CAPA. When you first initiate a CAPA, someone needs to perform an investigation to determine the root cause. This person will need to review records and analyze data. Based upon the data analysis, you may determine that a CAPA is not needed, but you will continue to monitor the process. Other times, the data analysis will verify that you have a systemic problem and a formal CAPA is needed. Based upon the severity of a quality problem, and the frequency of that problem, you should prioritize the CAPA as low, medium or high risk. Top management should prioritize resources for completing the CAPA based upon the risk. Quality should monitor implementation and closure of CAPAs and report to top management. Finally, sometimes you have a larger problem that requires a quality plan to make changes throughout your quality system. Implementing this risk-based approach will also meet the requirement in ISO 13485:2016 for implementing a risk-based process. Most people verify CAPA effectiveness by verifying that all the actions planned were completed, but this is not a CAPA effectiveness check. An effectiveness check should use quantitative data from your investigation of root cause as a benchmark. Then you should verify that the performance after corrective actions are implemented resulted in a decrease in the frequency of the quality problem, a decrease in the severity of the quality problem, or both. Ideally, a process re-validation was performed, because validation protocols are required to include quantitative acceptance criteria for success. If you are interested in more training on CAPA, you might be interested in purchasing Medical Device Academy’s Risk-Based CAPA webinar. 99% of companies hold off on their training until a procedure is officially released as a controlled document. In my experience, however, these procedures seem to have a lot of revisions made immediately after the initial release. New users ask simple questions that identify sections of procedures that are unclear, or were written out of sequence. Therefore, you should always conduct at least one training session with users prior to final review and approval of a procedure. This will ensure that the final procedure is right the first time, and it will give those users some ownership in the new procedure. After you train your initial group, and after you make the edits they recommended, ask those trainees to review and edit your changes to the procedure. Sometimes we don’t completely understand what someone is describing, and sometimes may be only half listening. Going back to those people to verify that you accurately interpreted their feedback is the most important step for ensuring that users accept your new procedure. After you approve your new CAPA procedure, make sure everyone in your company is trained on the final version of the procedure. CAPA is a critical process (i.e., “the heart”) in your quality system. Everyone should understand it. You should also provide extra CAPA training for department managers, such as root cause analysis training, because they will be responsible for implementing CAPAs assigned to their department. You can use this 7-step process for any procedure, but ensure you use it for the most important process of all—your corrective and preventive action process. I am always looking for new and creative ways to help people understand the importance of maintaining an effective Corrective and Preventive Action (CAPA) program. If my last dozen CAPA blogs were not convincing enough, maybe this list of suggestions will help. 1. If someone doesn’t follow procedures, just fire them. The employee in question is obviously the root cause. Management cannot be held responsible for the actions of employees. Once, I read a corrective action plan that indicated termination was the correction for a missing training record. The QA Manager clarified this statement by saying that the employee resigned for personal reasons, and there was no opportunity to train the employee. The CAPA record also indicated that 100% of the training records for manufacturing employees were reviewed for completion. There were a few records identified as incomplete, and those employees were trained—not terminated. The company also implemented a tracking tool to monitor training records. As a general rule, termination is not an acceptable corrective action or correction. 2. If CAPAs are open longer than your procedure allows, close the existing CAPAs the day before the CAPAs become overdue, and open new CAPAs. CAPAs are not “closed” until all nonconformities have been corrected, corrective and preventive actions are implemented, and effectiveness checks are done. If the corrective and preventive actions were not completely effective, some companies chose to reopen the record and expand the plan of corrective and/or preventive actions. Other companies chose to open a new CAPA record, and reference the new record in the effectiveness check section of the previous CAPA record. Either approach works, but you cannot close an incomplete record and remain compliant. 3. To verify effectiveness of corrective actions, just include a copy of your document change order. Documenting changes to procedures meets part of the CAPA requirements, but this verifies implementation—not effectiveness. In order to verify effectiveness, you need to verify that a nonconformity, or a potential nonconformity, will not recur. Low frequency defects are often hard to directly demonstrate. The best approach is to validate the process parameters to demonstrate quantitatively that the process capability has improved. For manual processes, you may need to test the new process to verify that the error will not occur, or will be detected. 4. If you can’t finish tasks on schedule, revise your plan. If you still can’t finish tasks on schedule, revise your plan again—and again. It’s appropriate to revise your plan if you discover additional causes that your initial investigation missed. You should not, however, be revising target completion dates—except in rare cases. You also should not need to revise your plan multiple times. 5. When you’re unsure why a problem occurred, identify the root cause as an unclear procedure and make a minor change to the appropriate SOP. Making changes to procedures is quick and easy to verify. Unfortunately, this approach is seldom effective at preventing recurrence. You need to develop new process controls to make errors impossible. Eliminate variation in raw materials, eliminate subjectivity in inspections and provide tools and fixtures to make manual processes capable of more consistent results. After you have reduced all three of these sources for process defects, then you are ready to revise your procedures and retrain employees. 6. Whenever an employee fails to follow a procedure, just change the procedure to require another person to verify that they did it right. If one employee fails to follow procedures 100% of the time, a second person manually inspecting will also not be 100% effective. Another method of process control should be used to ensure that your process results in conforming product. Adding more people provides a false sense of confidence. The use of objective measurement and go/no go fixtures provides a higher degree of certainty. 7. Write a justification for extension of the implementation timeline if a CAPA is about to become overdue. Justifications for extension provide objective evidence that management is aware that a CAPA plan is not meeting the target completion times. This is necessary on rare occasions, but extensions should never become routine. Also, if the progress of a CAPA is slow, monitoring should be frequent enough that management can release additional resources, or re-prioritize assignments in order to catch-up with the target completion date. 9. To monitor your CAPA program, conduct weekly CAPA board meetings where a person is asked to explain why the CAPA they were assigned is overdue. Anyone can make an excuse, but excuses will not complete CAPAs. CAPA boards and weekly meetings can be extremely valuable, but your CAPA board should rely on three rules: 1. Managers need to be present in order to re-allocate resources and re-prioritize tasks. 2. CAPAs that are on schedule or ahead of schedule require no further discussion. 3. Anyone assigned to a CAPA that is behind schedule should request help and suggest solutions prior to the CAPA becoming overdue. 10. Do not assign other departments the responsibility for CAPAs, because only QA has the training and competency to conduct an investigation of root cause, and write a CAPA plan. One of the most effective CAPA management tools I observed was a visual communication board that used color coded paperclips which identified resources assigned to CAPAs. By limiting the number of paperclips to equal the number of resources allocated to CAPAs, that company was able to level the workload of CAPA assignments to match the available resources in each department. You can only achieve this level of efficiency and effectiveness if multiple people in multiple departments are trained and competent to investigate root cause and write CAPA plans. CAPA should be a core competency for every department, because it’s the best process for fixing and preventing problems. Disclaimer: If you missed my sarcasm, these are ten ways to mis-manage a CAPA program. The brief paragraph after each numbered example is intended to provide the actual recommendation for effective management of your CAPA program. If you are interested in learning more about CAPA, please register for the Medical Device Academy’s CAPA Workshop on October 3 in San Diego. Click here to register for the event: http://bit.ly/MDAWorkshops. The author discusses how formal CAPA training can help solve the four most common CAPA deficiencies, and help avoid FDA 483 citations. Corrective And Preventive Action (CAPA) is considered to be one of the most critical processes in a Quality Management System (QMS). CAPAs prevent nonconformities from recurring, as well as identify potential problems that have may occur within the QMS. Both the CFR (820.100) and the ISO 13485 Standard (8.5.2 and 8.5.3, respectively) include similar requirements for establishing and maintaining a compliant CAPA process. The concept seems pretty straightforward, right? Then why do so many companies struggle with this process, and go into panic mode during FDA inspections and Notified Body audits? CAPA process deficiencies have long been the number one Good Manufacturing Practice (GMP) violation cited in FDA Warning Letters. Therefore, providing trained experts to teach the CAPA process is well worth the investment to provide your employees with the expertise needed to implement a sustainable, effective and compliant process. Support from top management is a must for success. Managers view CAPA as a necessary evil and apply minimum effort and resources to complete the required paperwork. All complaints, audit findings, shop floor nonconformities, etc., go straight into the CAPA system, resulting in what is known as “Death by CAPA.” There are hundreds of CAPAs to be dealt with, but the CAPAs languish and quickly become a mountain of overdue records. The lack of ability to conduct effective root cause analysis results in, at best, a band-aid solution, and recurrence of the same issues time and again. There is no risk-based or prioritization process that provides a triage for determining when a CAPA is appropriate, and how to classify its criticality. CAPA forms are either too restrictive, such as using “yes/no” questions, thereby stemming the creative flow of process thinking or, too open-ended, leaving the CAPA owner with little guidance for getting to the true root cause. Trending and metrics that would highlight quality issues before they become complaints are lacking, so most CAPAs are last-minute reactions to a crisis, instead of proactive improvement projects. Senior management has not allocated sufficient time and resources to CAPA owners in order to develop expertise, and clearly do not understand the nuances of FDA compliance, the ISO Standard, and responsibilities of CAPA ownership. FDA 483 observations, Warning Letters and loss of your ISO 13485 certification are possible consequences of failing to manage your CAPA process. Imagine explaining to your customers why you lost your certification, and why they should keep you as a trusted supplier. That is not a conversation you want to have. A weak CAPA process allows nonconformities to recur, results in manufacturing downtime, requires rework, and ends with scrapping product or lost customers. The consequences of a weak CAPA process negatively impact your company’s financial strategy and goals. In order to prevent an increase in the cost of poor quality, your business cannot remain static. You need to improve and adopt best practices. Your CAPA process is a systematic way to make those improvements happen. Characteristics of an Effective CAPA system? CAPA training should teach you how to reduce the length and number of investigations. Training will also help you master current problem-solving methodologies to identify true root causes, utilizing facts, instead of guesswork or opinion. The proper identification of the true root cause of a problem is critical, because otherwise your CAPA plan will fail to fix real problems. Not all formal training needs to be in-person. Face-to-face training can be supplemented with more cost-effective training of concepts using webinars and recorded presentations. Interactive training is needed to supplement this training, so that students can practice what they learn. Each of these deficiencies are addressed directly by CAPA training. Formal CAPA training reviews each of the requirements for your CAPA process, and trainers will often share samples of CAPA procedures and CAPA forms that they wrote and found to be effective. Learning multiple root cause investigation techniques, and practicing them using the case study technique, ensure that CAPAs are thoroughly investigated, rather than identifying superficial symptoms. CAPA metrics are introduced during training to ensure that the CAPA process owner knows best practices for monitoring and analyzing the process. Finally, CAPA training includes specific examples of what is, and what is not, a proper technique for performing an effectiveness check. The author provides two steps to consider taking now and steps to take in the future that will help keep design projects on schedule using the CAPA process. The ability to get new, high-quality products to market quickly is the most important core competency for a company to develop. What is your company doing to improve the performance of your design teams? If you have trouble answering the above question, you should consider performing a detailed internal audit of your design control process: http://bit.ly/AuditDesign. The only significant change I would make to my recommendations from 2012 is to follow the GHTF guidance document for creating technical files using the STED format, instead of using NB-MED 2.5.1/Rec 5: http://bit.ly/GHTFSTEDGuidance. This approach to creating a technical file lends itself to meeting the Canadian Requirements for Medical Device Licensing, and this is the preferred format of Technical Files in Annex II of the proposed EU regulations. At the end of the blog on how to audit design controls, Step 7 states that you should, “Ask the process owner to identify some metrics or quality objectives they are using to monitor and improve the design and development process…If there are no metrics being tracked by the process owner, you might review schedule compliance.” The two most common reasons why design projects are not able to keep pace with the design plan schedule are: 1) there are insufficient resources allocated for the project, and 2) the estimates of the duration for tasks in the schedule are too aggressive. Task duration is the easiest quality objective to track performance against. Whether you track design projects with an Excel spreadsheet or Microsoft Project, you can easily compare the actual duration of any project task with the estimated duration that was planned at the beginning of the project. It is important to measure the duration in labor hours, rather than using the number of people, because most design team members are multi-tasking. You can and should mine the data from previous design projects, because this information is available now. As you go through historical data, you will also realize where there are weaknesses in how you capture data regarding labor hours. Once you have the raw data, I recommend analyzing the data using % deviation and total hours. The % deviation will tell you which estimates were the least accurate, and the total hours will tell you which estimates have the most significant impact on the total project. Ideally, you will collect data from multiple projects, so that you can determine if the deviations are consistent from project-to-project. This data analysis is important, because the data analysis will help identify the root cause for inaccurate task duration estimates. You may also want to perform a Pareto Analysis of the data to prioritize which project tasks would benefit most from more accurate estimates. Once you have identified the root cause for inaccurate estimates, you can initiate Corrective And Preventive Actions (CAPA), where appropriate. You may heard the phrase “Do more with less” but I like to joke that design teams are expected to “Do everything with nothing.” If you design team is monitoring the accuracy of take duration estimates for design projects, the accuracy of your project plans should improve. Your management team should also develop a greater confidence in your teams’ ability to forecast product launch dates thereby the estimates for resource needs. Managers frequently challenge you to achieve the impossible. You will be able to estimate the amount of time to market that can be reduced by adding resources. You will be able to estimate the cost impact of unrealistic management timelines—instead of saying “I can’t push it any faster Captain.” (my favorite Star Trek quote). The answer to the following question may help you identify your next design process improvement. How close are your estimates to achieving a Cpk > 1.33 for completing design verification protocols on-time? If you are interested in learning more about CAPA, please register for the Medical Device Academy’s CAPA Workshop on September 9 in Orlando, or on October 3 in San Diego. Click here to register for the event: http://bit.ly/MDAWorkshops. This article reviews explains how to conduct a quantitative CAPA effectiveness check, and you will also learn three methods NOT recommended. making sure mistakes don’t occur 3x in a row. The best method is to establish quantitative criteria for effectiveness based upon data collected during the investigation of root cause. The graph above is an example of objective evidence that a preventive action was effective. The graph shows that the process capability (Cpk) was improved from 0.837 to 2.50 by changing a process set-point to adjust the mean of the dimension closer to the center of the specification range. This is typical of adjustments made during process validation and re-validation activities. When a nonconformity is identified during an audit, the laziest way to “fix” the problem is to revise your procedure. Despite the fact that most FDA 483s identify inadequate procedures as the reason for an observation, your procedures are seldom the problem. Your employees may not even be following the procedures. In fact, repeatedly revising procedures may actually be part of the problem. If you must revise your procedures, please involve the people that actually use the procedures. During your last surveillance audit you may have revised the procedure, but your auditor noticed that there were no retraining records for employees that were performing the revised procedure. In fact, one interviewee was unable to identify where the new inspection step could be found in the revised procedure. It’s too bad the interviewee didn’t notice the bold and underlined text indicating recent revisions. Your auditor wonders how effective your retraining process is. Last month a manufacturing engineer was assigned to perform an effectiveness check related to corrective actions implemented in the incoming inspection process. The procedure was revised to clarify the proper procedure for statistical sampling of rolls of plastic film as a corrective action. The engineer sampled the three most recent lots of the same plastic film that was incorrectly sampled in the past. All three lots were correctly sampled in accordance with the revised procedure. The engineer reported that the corrective actions implemented were effective. However, you have two new nonconformities on your desk from manufacturing related to incorrect sampling procedures during incoming inspection of other raw materials. Now you wonder if the incoming inspection procedure was the real root cause. Instead of adding something to your procedures each time someone makes a mistake, you might want to think about how you can simplify and streamline your procedures with fewer words. You can say things more clearly with pictures and flow charts instead of hundreds of words. Training effectiveness can be verified with exams that ensure employees “read and understand” your revised procedures. Finally, when you identify a nonconformity with one product, you need to ensure that you consider how similar mistakes might occur with similar products. Maybe you need a process for incoming inspection that doesn’t rely upon someone reading procedures. The biggest weakness of the auditing process is that it relies heavily upon the subjective opinion of an auditor. This is why auditors are supposed to audit against objective audit criteria in an international standard. The need for objectivity is also why there are guidance documents to clarify a consistent interpretation of those standards. Therefore, when you perform an effectiveness check, you also need objectivity. The best way to ensure objectivity is to establish documented criteria for effectiveness prior to finalizing your corrective action plan. Ideally, that will be in the form of a prospective process validation protocol with quantitative acceptance criteria. The single best way to ensure objectivity when you are performing a CAPA effectiveness check is to define the post-implementation goal in terms of a quantitative quality objective. Ideally, you can graph the quality metric using historical data and current data. If you need statistical analysis to see a difference between pre- and post-implementation of the CAPA, then your CAPA was not effective. If your graph looks like a miracle happened and the metric changed almost overnight, and timing corresponds to the date your corrective action(s) was implemented, then your CAPA was effective. Where will it be measured? When will it be measured? How will measurements be analyzed? Who will data analysis be communicated to? Many companies set arbitrary deadlines for performing an effectiveness check (e.g., – between 30 and 60 days of implementation of corrective actions). Some companies use a risk-based approach to their CAPA process, and the urgency of effectiveness checks may be a function of risk. I recommend a completely different approach. Instead of using an arbitrary or risk-based approach, I recommend monitoring your new quality metric to estimate how long it will take to reach your new quality objective. If you are interested in learning more about CAPA, click here to register for Medical Device Academy’s Risk-Based CAPA webinar. The author discusses why preventive action is important in developing a sustainable and robust quality system and where to locate preventive action sources. Most ISO auditors and FDA inspectors view CAPA as one of the most important processes in your quality system, but the approach to preventive actions is distinctly different between the ISO Quality System Standards (i.e., – ISO 9001 and ISO 13485) and FDA regulations (i.e., – 21 CFR 820.100). Throughout the FDA QSR, corrective action and preventive action are always found together, while in the ISO Standards, preventive action is a separate clause (i.e., – Clause 8.5.3). The wording of the two clauses is nearly identical, but ISO certification auditors tend to be purists. Therefore, your ISO certification auditor will expect you to have at least some examples of CAPAs that are 100% preventive. In fact, many auditors will issue a nonconformity if you have no examples that are 100% preventive. Why is Preventive Action Important? While I was conducting certification audits, I noticed that the better quality systems tended to have several examples of preventive actions. There were a few companies that actually had more preventive actions than corrective actions, and the quality systems at those companies happened to be much stronger in general—not just their CAPA process. Is this a coincidence? No, the CAPA process is how you correct and prevent quality problems. In order to find preventive actions you actually have to develop your other quality system processes. These companies have strategically chosen to develop their quality systems to a higher level of performance, because they know that preventing quality problems results will cost substantially less than waiting until problems occur, and then fixing those problems. These companies often talk about the “Cost of Quality,” and when you tour their facility, you see quality objectives being communicated to everyone. As a certification auditor, I was not allowed to “consult,” but was able to mention guidance documents that might help. Therefore, the number one guidance document I recommend is 13485 Plus (a document sold by the Canadian Standards Association – http://bit.ly/ShopCSA). In addition to the sources listed in guidance documents, there are three other sources that I personally recommend to consulting clients. One source is your internal audit process. Auditors verify conformity of processes, but internal auditors should also look for processes that are inefficient and need improvement. When auditors are performing a process audit, some process owners have difficulty identifying process metrics that are being tracked for each process. Auditors should be trained to follow the audit trail when there is an absence of process monitoring, because processes that are not already measured usually have more room for improvement than processes currently being measured. Another source of preventive actions is the Total Product Lifecycle Database on the FDA website (http://bit.ly/FDATPLC). Every three-letter product code has a corresponding database report that you can use to identify product malfunctions and adverse events associated with competitor products. Learning from the mistakes of your competitors and implementing appropriate preventive actions internally is a great way to avoid the need for corrective actions—especially for design malfunctions. The most fruitful source of preventive actions, however, is data analysis of process control monitoring. This source can identify negative trends within your company’s manufacturing process and suppliers’ processes. Catching a negative trend before products and components are nonconforming reduces the number of corrective actions needed, cost of scrap or rework, and eliminates delays that result in customer complaints. To be successful in achieving this Quality Objective, you will need to increase your preventive actions and decrease the number of corrective actions. Reduction of corrective actions indicates that you are identifying potential problems before a corrective action is required, while the increase in preventive actions indicates that your process for identifying potential problems is becoming more effective. If you are interested in learning more about preventive action, please register for the Medical Device Academy’s CAPA Workshop on September 9 in Orlando, or on October 3 in San Diego. Click here to register for the event: http://bit.ly/MDAWorkshops. The author describes four tools (Five Why Analysis, Is/Is Not Analysis, Fishbone Diagram and Pareto Analysis) and how each one can help conduct effective root cause analysis. Quality problems are like weeds. If you don’t pull them out by the root, they grow right back. If your auditor identifies a nonconformity and you disagree with the finding, then you should not accept the finding and state your case. If an inspector rejects a part and you believe the part is acceptable, then you should allow the part to be used “as is.” In both of these cases, however, you need to be very careful. Sometimes the problem is that “acceptable” is not as well-defined as we thought. I recommend pausing a moment and reflecting on what your auditors and inspectors are saying and doing. You may realize that you caused the problem. 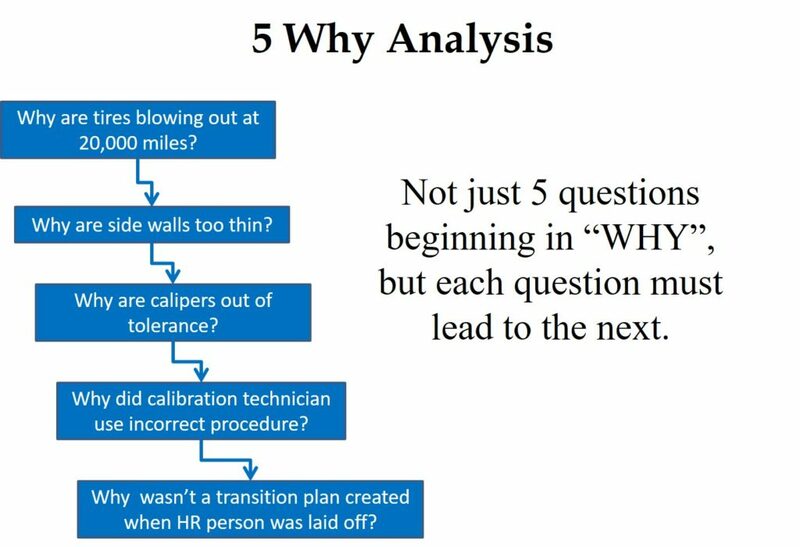 A “Five Why Analysis” is not just five questions that begin with the word “why.” Taiichi Ohno is credited with institutionalizing the “Five Why Analysis” at Toyota as a tool to drill down to the root cause of a problem by asking why five times. I have read about this, used this tool, and taught this concept to students; but I learned of a critical instruction that I was missing when I read Toyota Under Fire. In that book, Jeff Liker makes the following statement, “Toyota Business Practices dictates using the ‘Five Whys’ to get to the root cause of a problem, not the ‘Five Whos’ to find a fire the guilty party.” At the end of the book, there are lessons learned from Toyota’s experience. Lesson 2 says, “There is no value to the Five Whys if you stop when you find a problem that is outside of your control.” If your company is going to use this tool, it is important that the responsible person is the one performing the five why analysis, and asks why they didn’t take into account forces that are out of their control. The next tool was presented to me at an AAMI course that I attended on CAPA. One of the instructors was from Pathwise, and he explained the “Pathwise Process” to us for problem-solving. A few years later, I learned that this tool is actually called the “Is/Is Not Analysis.” This tool is intended to be used when you are having trouble identifying the source of a problem. This method involves asking where the problem is occurring as a potential clue to the reason for the problem. For example, if the problem only occurs on one machine, you can rule out a lot of possible factors and focus on the few that are machine-specific. The reverse approach is also used to help identify the cause. You can ask where the problem is not occurring. This approach may also lead you to possible solutions for your problem. For example, if the problem never occurs on first or second shift, you should focus on the processes and the people that work on the third shift to locate the cause. The “Is/Is Not Analysis” is seldom used alone, but it may be the first step toward locating the cause of a quality problem. This name comes from the shape of the diagram. Other names for this diagram are: the “Cause and Effect” or “Ishikawa”diagram. If a problem is occurring in low frequency and has always existed, this might not be your first tool. However, I typically start with this tool when I am doing an investigation of nonconforming product—especially when rejects suddenly appear. If you are totally baffled about the cause of a problem, brainstorming the possible causes in a group sometimes works. However, I like to organize and categorize the ideas from a brainstorming session into the “6Ms” of the Fishbone Diagram. The fourth root cause analysis tool is the Pareto Analysis–named after Antoine Pareto. This tool is also a philosophy that was the subject of a book called The 80/20 Principle: The Secret to Achieving More with Less. The Pareto Analysis is used to organize a large number of nonconformities and prioritize the quality problems based upon frequency of occurrence. The Pareto Chart presents each problem in descending order from the highest frequency to the lowest frequency. After you perform your Pareto Analysis, you should open a CAPA for the #1 problem, and then open a CAPA for the #2 problem. If you get to #3, consider yourself lucky to have the time and resources for it. If you are interested in learning more about root cause analysis and actually practicing these techniques, please register for the Medical Device Academy’s Risk-Based CAPA training. Your CAPA process is the most important process in your Quality System for two reasons. First, CAPA is the tool you use to fix quality problems. Second, your CAPA process is guaranteed to be an area of interest for your next FDA inspector. If CAPA is so important, why do companies still have ineffective CAPA processes? When auditors review a CAPA process, some of them start by reading the procedure. When FDA writes a 483 observation about CAPA processes, the wording begins with “Procedures for corrective and preventive action have not been adequately established. Specifically…”. The approach of auditors and inspectors seems to suggest that your procedure is the key to an effective CAPA process, but your procedures are not the reason for success or failure of processes. Processes are effective when management of the processes is effective. If a CAPA falls behind schedule, writing a justification for an extension is a process “solution.” A real solution is managing the process better. Management needs to monitor the progress of CAPAs on a regular basis, should prioritize resources to ensure that CAPAs are completed on time, and needs to make decisions on which actions should be taken to prevent recurrence of quality problems. Therefore, you need to spend more time developing a method of managing CAPAs than you spend developing the CAPA process itself. What is an A3 Report? An A3 report is a tool that is ideally suited for managing CAPAs. “A3” refers to the size of the paper used (i.e., – approximately 11”x17”). An A3 report is a one-sided, single piece of paper that is used to build consensus among company management when you are making an important decision. The initial draft of the A3 report is distributed to each of the affected departments to ensure that all possible inputs to a quality problem are received. By encouraging 360-degree feedback for a proposed solution to a quality problem, you will ensure that the CAPA you develop addresses the issue completely. In addition to encouraging 360-degree feedback an A3 report includes an analysis of the problem, identification of the cause, proposed actions which require management decision, a section for documenting actions taken and a follow-up section for management to review at specific milestones during the implementation plan. Including all of this information in one page forces CAPA owners to summarize information for management, and the standardized format makes it easier for managers to locate the information they want. Here’s how these sections would be used for managing CAPAs. This section is identical to the section of a traditional CAPA record, where the investigation of the problem is documented. This is where tools such as 5 Why analysis, Pareto charts and Fishbone Diagrams would be used to illustrate the analysis of the problem. This section may change a great deal during the 360-degree review of the A3 report. In this section, there should be a concise statement of the root cause for corrective action plans, or the potential cause(s) for preventive action plans. During the initial review of the A3 report, management may ask the person or team assigned to the CAPA to investigate the problem in greater depth, or investigate other possible sources of information if the analysis appears to be inadequate. Management should also ensure that the causes are within the control of the company to correct or prevent. Identifying a cause that is outside the control of the company is just placing blame. This section is similar to a typical CAPA plan, but the section includes the reason(s) why the proposed actions are recommended. The reasons why actions are proposed is important during the process of management reviewing the initial A3 report and approving the recommended actions. Best practice is to phrase the reasons in terms of quantitative results that will be achieved, because this will provide a framework for metrics during follow-up by management. This section of the A3 report is updated throughout the implementation of the project. By comparing this section with proposed actions, management can monitor the status of each task included in the CAPA plan. This section of the A3 report identifies how management will monitor the implementation of actions and when. The initial A3 report identifies what management will be monitoring, how it will be monitored and at what milestones. Ideally, the monitoring includes quantitative metrics that demonstrate effectiveness of the CAPA. During implementation of the CAPA plan, actual metrics will be recorded in this section, and any adjustments that management makes are recorded here. If you are interested in learning more about A3 reports, you can learn more from Daniel Matthews at: http://bit.ly/A3Workbook.